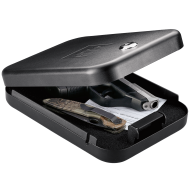 The GunVault® Nano Vault 300 (NV300 or sometimes GVNV300) is a portable, compact pistol case. The GunVault® Nano Vault 300 is the largest of the three Nanovault pistol cases. It offers the perfect security for small valuables being kept in dorm rooms, gym lockers, RVs, boats and other places you might spend time. 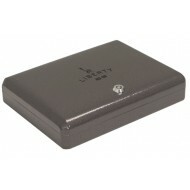 Whatever small valuable you travel with such as jewelry, a watch, an Ipod can be secured in the GunVault® Nano Vault 300. Put your valuables in the Nano Vault - use the security cable to fasten it to an immovable object in your hotel room, and go to the pool or exercise room with piece of mind. Please double check the dimensions of this pistol case to be sure your handgun can fit. The NanoVaults all meet TSA requirements but rules about flying with a firearm vary from airline to airline and state to state. The Nano Vault 100 (NV100 or sometimes GVNV100) is the most compact and affordable of GunVault's Nano Vault pistol case series. The Nano Vault 100 pistol case meets TSA airline firearm guidelines and fits discreetly in a bag, briefcase, desk or under a vehicle seat. The NanoVaults all meet TSA requirements but rules about flying with a firearm vary from airline to airline and state to state. The Nano Vault 100 features an easy-to-operate combination dial lock system, 21-gauge steel construction and 1.25-inch thick memory foam interior. Each unit comes standard with a 1,500-pound test security cable. When the cable is wrapped around any fixed object and slid over the lock receiver inside the security box, both the Nano Vault and any valuables will be securely attached. 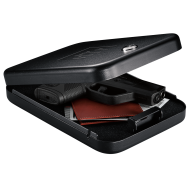 Store your hand gun or small valuables in the Gun Vault Nano Vault 200 (NV200, sometimes GVNV200) pistol case. It is compact, secure, and affordable! This is the middle size model of the three GunVault Nano Vaults. 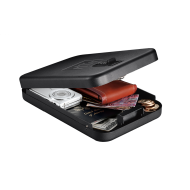 A Nano Vault is perfect for home, travel or concealed-weapon permit holders. The Nano Vault meets TSA airline firearm guidelines and fits discreetly in a bag, briefcase, desk or under a vehicle seat. The NanoVaults all meet TSA requirements but rules about flying with a firearm vary from airline to airline and state to state. This pistol case comes with a 1500lb test cable for secure lock down. 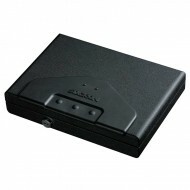 The portable Stack-On security case is designed for easy installation with a cable. It can be secured under a vehicle seat or to furniture in your RV. 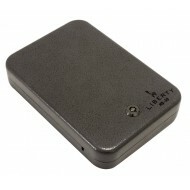 Slim enough to secure in a briefcase, you can secure your keys and cell phone and other small items. The portable Stack-On security case meets TSA airline firearm guidelines. If you plan to transport or store a pistol be sure to note that the dimensions of the Stack-On security case are 11"W x 8 1/4"D x 2 3/8"H. This means not all hand guns will fit this case. 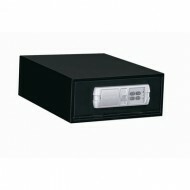 This pistol safe has an electronic lock which has an easy to read key pad and includes a low battery warning light. To prevent tampering this pistol safe electroni lock has a time out period after 3 incorrect combination attempts. In case you prefer to use a key, a back up key is provided. For security, this pistol safe includes 2 live action locking bolts and concealed hinges. A solid steel, pry resistant door has concealed hinge. When your purchase a QAS-1304-E pistol safe your package will Include a mounting plate. The mounting plate can be affixed to a location such as an RV or in the trunk of your vehicle. The pistol safe affixes to the mounting plate with one bolt inside the pistols safe. 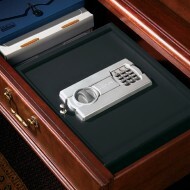 With pre-drilled for direct mounting, the pistol safe can be bolted down under the bed or another location.